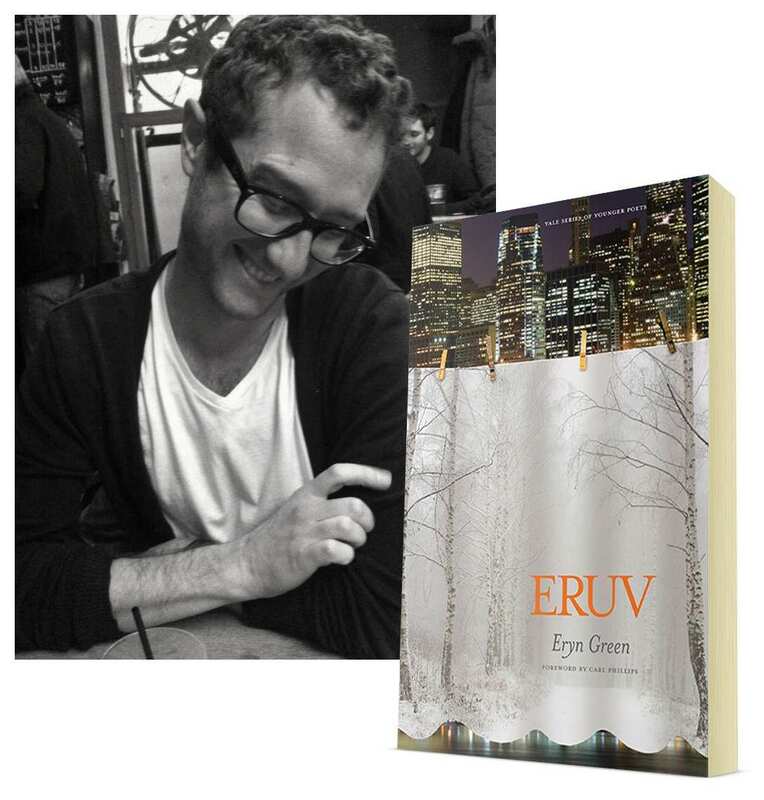 Yale University Press had the pleasure of interviewing Eryn Green, whose anthology, Eruv, won the Yale Series of Younger Poets competition in 2013. Here, we discussed about the life of a poet and the relevance of poetry in today’s modern society. Yale University Press: What prompted you to start writing? And why poetry in particular as opposed to prose? Eryn Green: I’ve been writing since I can remember. I recall walking upstairs and explaining to my parents very calmly that I wasn’t going to be able to make it to dinner because I was “really on a roll” with a story I was writing about a guy who waits his whole life to go to outer space, but misses his rocket ship to Mars because he’s kind of OCD and has to arrange everything in his house a certain way or else he’s sure the rocket will crash. I was 8-years-old. So, the impulse has always been there. But I began writing poetry in earnest in college, after years of fiddling with it, after taking writing workshops with some amazing teachers and meeting a mentor and really finding my chosen family of friends in the writing community at the University of Utah. I realized poetry was as much about what I wrote as it was about how and with whom I was writing. I knew this was what I wanted to do immediately. YUP: What or who are your primary sources of inspiration? EG: My friends and family, first of all. I am intensely lucky to have so many gifted writers around me every day—from my talented partner Hanna Andrews and the library of excellent work that has come out of Switchback Books and Coconut Books over the last handful years, to dear friends from Utah and Denver like Nathan Hauke, Kirsten Jorgenson, Geoff Babbitt, Stacy Kidd, Shira Dentz, Kathryn Coles, Brenda Scieczkowski, Chris Kondrich and Sam Knights, all of whose work slays me. Denver at this moment is a really terrific place to be a poet—we have an amazing community centered around the various creative writing programs in the vicinity and the flourishing small-press scene building along the Wasatch Front. All of that stuff helps keep me inspired. I also am a big fan of the forest and the national park and the humble bog. YUP: How would you describe your overall process as well as your day-to-day writing schedule? EG: Well, I have a very tiny 4-month-old baby girl, so my day-to-day writing schedule changes day-to-day. Which, as it turns out, isn’t such a big deal—actually, it fits right in with my long-standing general approach to writing. I write in a journal, nothing ever finished, usually scribbling just small jots and tittles, and then I return to my notebooks later as a kind of source of compost and inspiration. I try to keep the process of writing a poem low-stakes as much as I can—I try to recognize my work within the broader scope of my life and the life of the universe, which sounds hokey, but is true. The stars and the sun make writing easier—if I don’t write a poem today, does anything suffer? No, assuredly not. The sky is still there, the ground is still there, the birds still know intuitively exactly when to strike up the band. Things remain well underway. So, writing for me is a way to recognize the larger conditions of things, and my place therein, and in this thinking writing a poem is inherently a moment of joy. YUP:Which audience (if any) do you have in mind when crafting your work? EG: It’s an interesting question. On the one hand, I live and work in a community of writers, many of whom I share my work with regularly. So, my friends are on my mind. But more conceptually, really, I think about writing as a kind of prayer—what is the audience for a prayer? It’s not God, exactly—and it isn’t just emptiness. It is some kind of point in-between, a flickering intelligence inside of space that I imagine—that’s who /what I figure is giving me the material in the first place, and so that is with what/who I often imagine myself writing to. YUP: How many rejections did you receive before your first published poem? EG: So many. Like, tons. Who even knows. An amount only measurable in bulk mass. YUP: What is your reaction to rejection? How do you internalize that experience? EG: Initially it was terrible, because I felt like I was up against an impenetrable wall of insider knowledge I didn’t hold. But, it turns out, I was just writing bad poems. Once I got a couple of poems accepted to journals, the still-constant slog of rejection became less intimidating and more motivating. My general reaction to rejection today is opening a beer. YUP: How do you know when your work is “finished”? Do you find yourself editing work that you deemed complete a long time ago? EG: I suspect that all writers are somewhat bad at this, but I know myself that I am never sure when a poem is over—perhaps a reason I write so many serial works. I think one of the jobs of the poet is not to dictate to the poem what its shape or content or exact parameters are going to be, because it’s a little tyrannical and anyone can learn how to execute this kind of poetry-by-way-of-rote-equation. No, a big part of being a poet is learning how to look and listen more carefully to the subject underhand, to become evermore attentive to your circumstances and the work that is revealing itself this moment in your writing. You know a thing is finished when it says it is. YUP: Mark Edmundson wrote an article for Harper’s last summer, claiming that American poetry is in decline. Do you see this as real problem in today’s literary landscape? EG: The first thing to say—and this is not said nearly often enough in the discussion of contemporary poetics—is that poetry itself cannot decline. Not in America nor on the Continent nor in the Southern Hemisphere nor Antarctica. This is why we come to poetry in the first place: it is beyond us. In the same way that matter cannot be created or destroyed, merely transferred, poetry—the substance of the thing, that which we are all working to translate and record in our poems—is an inexhaustible natural resource. It is of the world, of the universe, and can no more decline than can the cosmos. So this brand of newspaper doom-saying is just bluster, and it feels comically curmudgeonly. We do not have to worry about poetry. That recognition alone is more liberating as a poet than I can possibly articulate. That being said, in direct answer to your question: no. Decidedly no. The poems coming out of America today are not declining in quality. Indeed, as it’s been said time and time again, the amazing proliferation of high-quality, experimental small presses publishing the work of an increasingly diverse range of poets makes this day—today—the most exciting time imaginable to read and write poetry. So you say you don’t like poetry? What kind of poems do you mean—we have other examples to show you. You say that the work was better in days gone by? Well, who knows. But there is certainly more poetry available now than ever before, in addition to all that came before, and while that might amount to a few stinkers here and there, in large it means a deeper and more satisfying literary landscape through which to saunter. We should be happy everyone isn’t Robert Lowell . YUP: What would be your advice for young poets or potential writers who are timid to dive into the process and don’t know how to start. to recipients that might be sympathetic, even if it isn’t an official contest period. Maybe people will just be happy to see your excellent work. Worst case scenario, they won’t be. Regardless, you’ll be better for getting it out into the world. YUP: Attention spans are deteriorating and we’re allegedly moving towards a post-literate society; why do you think poetry remains relevant today? EG: Poetry is the rare form of art or literature that rewards equally on the smallest level—the music of the phoneme, the word, the line—as it does on the level of the whole work. So, even if attention spans are getting shorter, poetry is still able to impart valuable experiences and lessons to readers. Poetry packs a big punch in a variety of small packages; you can get something out of a poem at almost any juncture. This is not to speak of the wealth of cool poetry that is directly wed to the internet and web-based technologies, which is a big wealth, a richness, all of which ought to be right in the wheelhouse of 21st century inclinations. Despite the popular move away from reading and the interruptions of modern living, poetry remains a really powerful way to remind people they are human and that life is beautiful and hard and worth paying real attention to. Poetry touches on that which is shared in common. Eryn Green is the author of Eruv, winner of the 2013 Yale Series of Younger Poets prize. He recently received his Ph.D. in creative writing from the University of Denver and holds an MFA from the University of Utah. His work has appeared in Jubilat, Colorado Review, Painted Bride Quarterly, and elsewhere. He lives in Denver, CO.